These Tom Yum crisps from Marks & Spencers are spiced with lemongrass, ginger and cayenne chilli. Cinabar hates lemongrass so I felt pretty rest assured that I'd get to eat most of the bag of these Tom Yum Potato Crisps to myself. Sounds selfish I know, but that's the type of snacking guy I can be when faced with one of my favourite flavours. I just love Tom Yum noodle soup and literally lap it up like an excited purring kitten whenever I have it. 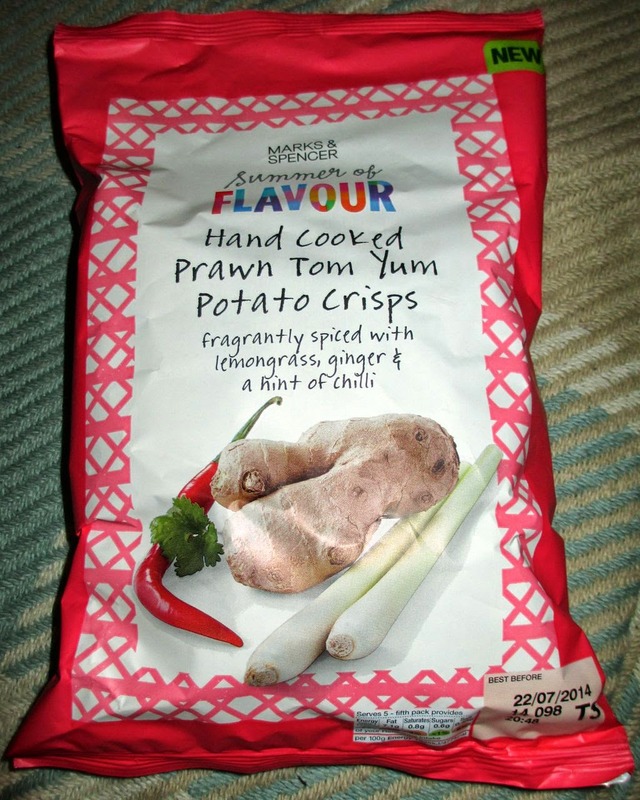 I've also enjoyed Tom Yum flavoured crisps before and wanted to see how these matched up to the Hairy Biker's offering. On opening the packet there was a heavy prawn, lemongrass and paprika smell from the crisps. Cinabar took one whiff and said she couldn't smell the lemongrass, but I could... Ha, ha. She took one bite of a crisp and said "Oh, but they do taste REALLY of lemongrass!" and stated that she hoped I was hungry. And I was! On first bite I noticed there was an initial taste of prawn followed by an almost soapy strong taste of lemongrass. This flavour of lemongrass travelled into the aftertaste with the paprika and luke warm cayenne chilli. There was no noticeable burn from the added chilli. These were very tasty crisps, but the overpowering soapy flavour of lemongrass almost even put a hearty Tom Yum fanboy like me off from finishing the packet. In fact I didn't manage to finish them off. I preferred the Hairy Biker's version of Tum Yum crisps as their flavours were more balanced and there was not a hint of a washing up bottle taste in site. Having said that I didn't blow one soapy lemongrass bubble whilst eating these crisps, but I sadly didn't enjoy them. Sorry M&S, but this is the first crisp flavour you've produced that I didn't like! 150g bag. Per 30g serving there is 143 calories, with 7.1g of fat and 0.6g of sugar. 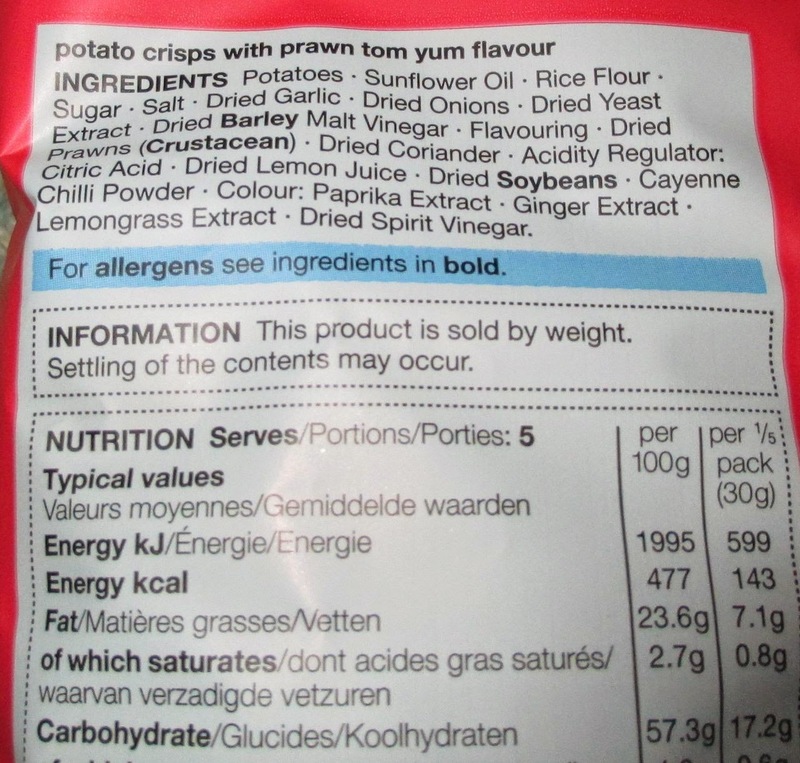 There are dried prawns in the ingredients, so these crisps are not for vegetarians. For the full list of ingredients, please is the photograph.